As my time permits, I'll be doing multiple posts about my impression of the Beta viewer. I'm liking what I see so far. In this installment of "Adventures With a New Viewer," Roderick Reanimator had to find his inventory, met a pretty woman riding her horse, teleported to Svarga, and conducted a few experiments without making too much of a fool of himself. Roderick rezzed, on the same machine that I'd used for testing the basic version of the Beta, but he appeared as the premade avatar he'd switched using Basic Mode's pick-a-look options. I had, after that, put him back into his usual outfit from another computer, but those changes did not "take" when I logged on today. I'm happy to say that nothing in his inventory has vanished, but then I'm still using the Beta Viewer on a different machine from my usual SL rig. I can see myself liking this client a lot. 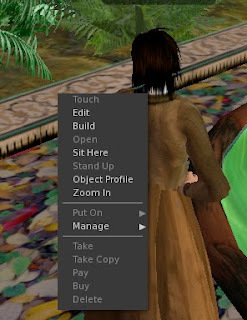 Linden Lab turned the call for a browser-based client into a client that looks a lot like a browser, back buttons and all. The interface is as clean, in advanced mode, as the lean, mean Firefox 4 broswer. The annoying sidebar from Viewer 2 can be clicked closed or open, so that would enable a builder to have enough real-estate on the screen for useful work. My objections to it vanished when I saw that. I have since come to understand that Viewer 2 has the same open/close feature. A right-click on the ground evokes a "build" option. There's also a "build" menu on the top of the screen. On my Mac, Cntrl + ALT + D brought up the familiar advanced menu. I selected quiet snapshots and elected not to play the typing anim (I leave it on only in big meetings, where it helps identify a "speaker"). I also found the environment editor with its advanced settings quickly, under the "world" menu's sun option. That was very helpful for taking snapshots. A Beta for Immersion? Augmentation? The integration of real-life and virtual identities does not go as far as Facebook proponents might wish, but immersionists may not like how quickly the Beta client pushes you to use voice. It is enabled by default (though easily turned off). The "me" menu has a "my voice" option that includes--if one subscribes--a morphing option for roleplay and gender-switching. Web profiles opened very slowly for me. I've not used them, so at this point I cannot comment beyond "that was slow." I take many snapshots, so I find one aspect of the Beta a bit annoying. When one clicks the "view" button, a very nice camera control appears. It's intuitive until you click off, then it vanishes. This means more clicks every time a photographer changes the angle for a shot. I do like the ability to toggle between presets for the camera--front, side, or rear. These make moving a bit odd, but they add a function that I've never used in another viewer, though perhaps I was not aware of it. Snapshots are easily done, from a camera icon at the bottom of the screen. Just as I was fiddling with the settings, Alecto Vella showed up on horseback. She notes that like Iggy, she goes out on the roads of SL exploring. I guess the horse does not cause the sim-crossing lag that my cars do, because she looked realistic trotting along the Linden highways. She agreed to pose for some snaps as Roderick learned the controls--pretty quickly in fact. Given Iggy's work to transcribe all of the VWER meetings and publish the chat as a public record, I needed to find if logging worked. It does, from a "privacy" tab under the preferences. That is the first option of the "me" menu. Perhaps using the word "privacy" is not only more intuitive but also a nod to those who seek to avoid giving too much first-life data away. We'll see how Linden Lab strikes that balance, but for me, it's soon back to Svarga to explore while using the new viewer.